Klaas Zonnebeld from Stabijhounkennel Fan it Heidehiem is one of the people who works with his Stabyhoun in the field. Here he describes a recent journey to Sweden to see whether his gun dog, Baike would live up to its description as a Pointer. According to the FCI and the Dutch kennel-club our Stabij is a Group 7 Gundog: a Pointer. It means that the dog must show the hunter where the game is and thereafter remain as motionless as possible. As most gun dog owners will testify to, this is no small challenge but one which I was about to put to my female Stabij Baike. Now spread out across Europe, the pointers have developed into many separate breeds. 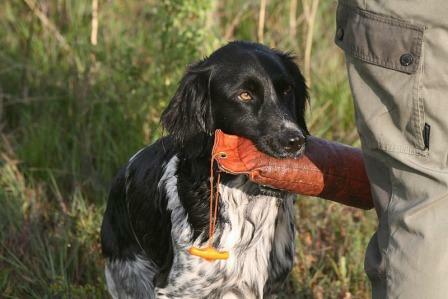 So does the Stabij still belong alongside the German Longhaired Pointer, Dutch Partridge Dog and the Munsterlanders? When you ask experienced breeders or people who work with their Stabijhoun, few talk about a Stabij that stands. So why is our Stabij in FCI Group 7? Perhaps because of the way it stands for a molehill. As a boy of eight, I frequently witnessed how our Stabij was ‘frozen’ above a molehill. As the sand began to move, Famke flexed all her muscles and suddenly, like an arrow from the bow, scratched the mole out of its hole and carried it in her mouth, still alive, over to me. Every now and then my dogs stand perfectly still and look at the side of a small pond to a duck, allowing nothing to distract their focus. They do the same for the occasional moving leaf in the garden; sneaking over and then striking with amazing speed and accuracy. 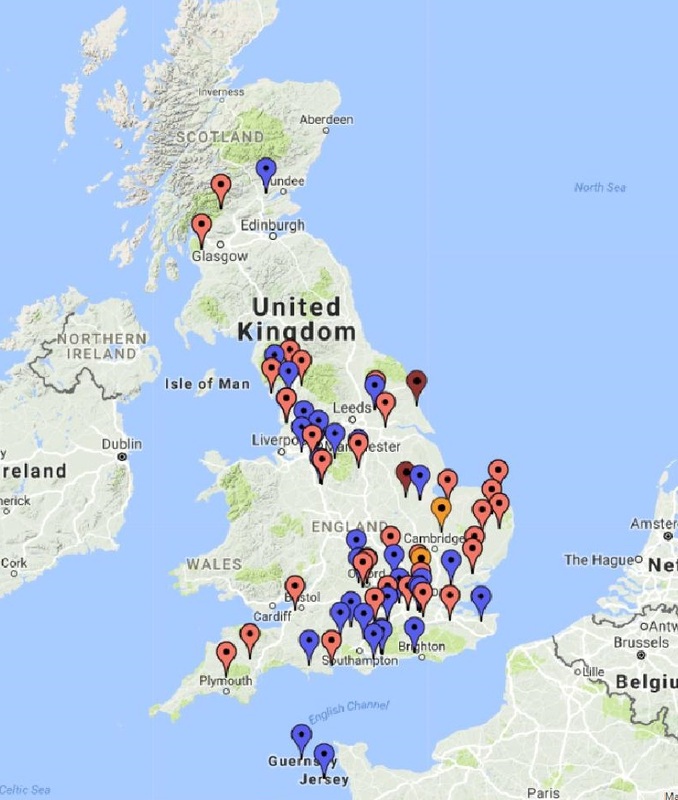 So perhaps the Stabijhoun does belong in the FCI Group 7, but so far no one has been able to confirm me why exactly that is. I love Sweden and with my family I visit the country at least twice each year. Our Baike had qualified for this field trial at the ‘Stabijspecial’ by successfully doing a drag and a water-apport. I was excited about experiencing more Stabij’s in the field and see if the Stabijhoun really does belong with the other pointing dogs in the FCI Group 7. After a 1200km journey, we arrived in Sweden just in time for an extra training day. Field work is not my field of expertise so I wanted to learn more; what is and what is absolutely not allowed. It was a great day’s work on a large field and I felt well prepared for the official trial. The other participants were international with dogs from Sweden, Norway, Estonia and of course my Baike from the Netherlands. There were four Stabij, one Drentsche Patrijshond, quite a few Weimeraner (short and long hair) and two Bracco Italiano dogs: all breeds that most definitely belong in FCI Group 7. Was I nervous? Absolutely! In fact I hardly slept that night. The chairman of the Swedish Stabijhoun Club gave a speech in English before introducing the judge. He was a serious-looking man, with a lot of experience to share with us. Importantly for me, he explained how this was not a contest to determine which dog was best but a demonstration to show you what your dog can do. I went first alongside a young Weimeraner. It was tough and I would like to have seen more experienced handlers go through the motions. But there we were; Baike on my left on a large field flanked by the Weimeraner. The Judge gave a call and we started. Baike ran at a reasonable speed. Every now and then she lifted her head slightly higher than normal to get air. All in all she worked well and remained in contact with me. In the distance I saw the Weimeraner working which was very interesting. Although he found himself in our side of the field a few times, both dogs were focussed on the task at hand and were unaffected by the competition. 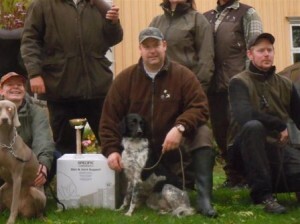 Klaas Zonnebeld with his Stabyhoun. Congratulations! Baike and I arrived back to a warm welcome, many congratulations and tips for how to improve further from the more experienced hunters. Baike got some food and a drink. I don’t speak much to her as she’ll pick up on my nerves. Instead I try to stay quiet and focussed. At noon I learnt that the other Stabijhoun was out of the trail. The Drent had scored a point and the owner was very satisfied and proud. This was no easy judge and he seemed keen to set expectations high while being shadowed by an aspiring judge. It didn’t help my nerves when I told me that I was up first again after lunch. In front of me was a rough field covered in low vegetation and tall grass. I gave Baike freedom. Almost immediately she went from right to left as if she begun to appreciate the task at hand. Suddenly the other hunter raised her hand to indicate that she had found something. I called Baike back, put her on the leach and waited – but it had been a false alarm. Again Baike began searching on my command and she did her best, walking in a nice pace and coping well in the dense cover. She did not found anything but when the judge called us over he praised my Stabij for working beautifully. I suggested that perhaps there was nothing to find and to prove me wrong, the judged sent an experienced elite Weimeraner and Bracco to walk some of the pieces that I already had walked with Baike. They too found nothing and so we remained in the game. Approaching 5pm, Baike was tired and sleeping but the day was not over. Although the judge reassured me that we would get a very nice report, our work that day would warrant no further qualification. I did not drive from Holland to Sweden for just a nice report so I decided to give it one final push. For another Bracco it was the same story; showing great spirit and skill but was unable to stand. A few seconds later Baike ran passionately through the cover – walking with a solid pace and clearly giving me everything she had left. But a hand went up and I had to call her back. I heard a shot. The Bracco had scored a point and I feared this was the end for us. With a grumpy face, the judge asked me to follow him. I was hoping for another chance and followed him as a young pup follows his mum. “Put your dog in here,” he said and so I did. The shot had spurred on a fresh bunch of energy in Baike and I had a good feeling. This was our moment. 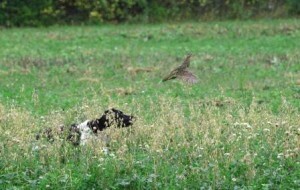 As she pulled to the left I saw in a flash on the right side a pheasant try to get away. Without saying a word, I sent my dog ​​to the right. She caught wind of the bird and looked at me out of the corner of her eye. I told her “easy Baike, easy…” Then everything happens in just a few seconds. Baike ran on the smell and she froze! I reached up my hand and almost hit the judge in his face because he was much closer to me than I thought. “Go ahead,” he said, so with the whistle in my mouth I gave Baike the “go” command. Right in front of her, the Pheasant flew up and the shot went off. I blew the whistle signal for sit and shouted “Sit!” ….ppph She did it! Excitement was in the air and Baike was on fire. Although she came back when I called her, I could tell she had pheasant on her mind. The judge asked me to let her go so I did and after just a few meters she froze again with her nose pointing. The judge slapped my shoulder and said “another one, let her go!” For the second time in just five minutes I gave the command “Baike go” and another pheasant took off. The shot went off and I yelled “Sit!” I couldn’t conceal my excitement – not least because we had searched all day for these birds with no luck. The adrenaline was rushing through my body. Had we made it…. In an open field with the shooter 20 meters away we had to do an apport. To calm down and give both myself and Baike a chance to recover, we did a short walk. The pressure was on. Everything depended on this simple retrieve. I stepped away from Baike who was now sitting as the bird was thrown into the air and a shot was fired. On the judge’s sign I gave the command for Baike to retrieve. It was perfect. It was with tears in my eyes that I took the pheasant from her mouth. The judge shook my hand. I lifted Baike up and gave her a big hug. Can the Stabij stand and does it belong in the IFC group 7? Absolutely! We turned back to meet up with the rest of the group and were greeted with cheers and congratulations. I weren’t the only one feeling emotional. What a day. What an experience. To me, Baike has always been a special dog; nice to train and a good, reliable working dog. That day she proved just how good she is. Wow. Training any dog in field work is hard work and requires both determination and patience. But when you experience the feeling of working in a true partnership, it all becomes worth it. No amount of money can buy what Baike and I share. As a Stabij lover, these are the moments I live for. These are moments I will treasure forever.